This third-class municipality, locally known as the Balikbayan town of the Philippines, has more to offer than its crownless bell tower and rustic surroundings. A cursory trip to the town (it was second after Makati City for having the most number of overseas Filipino workers in the 1970s according to town records), would show dozens of medium to large concrete houses, a testament to Bacarra as home of most “Hawaiia-nos” (Ilocanos living in Hawaii and other parts of the United States). 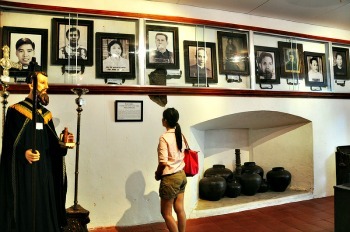 Near the tower and next to the Bacarra church is a museum of religious and cultural artifacts housed inside the restored St. Andrew the Apostle convent. The once-abandoned two-storey convent was given a facelift with funds coming from the National Commission on Culture and the Arts. The Museo de Bacarra formally opened in early November 2012 after more than a year of collecting artifacts contributed mostly by residents. Weeks after its opening, Ascencion Bonoan, vice chair of the town’s tourism and development council, said tourists looking for a fresh glimpse of Ilocano history and interesting remnants of religious beginnings are trickling in. Bonoan would spend time in the museum on days when tourists come in droves so that he could give them a tour and a briefer on the museum’s beginnings including anecdotes on the town’s important periods. He said Spaniards once referred to Bacarra as the Vatican of the Philippines because it churned out the most number of locals who embraced priesthood since the Spanish period. A section of the Museo de Bacarra is devoted to the town’s religious icons from former priests to age-old images and church relics including baptismal archives that date back to 1702. Bonoan, born and raised in Bacarra, said powerful earthquakes sculpted the town’s belltower to what would later become a cultural art-piece. “The three-tiered bell tower stood proudly in all its glory for hundreds of years since 1828. Periodic earthquakes caused its dome to lean beginning 1931. It crumbled further when another tremor struck in 1971,” he said. Then President Ferdinand Marcos recognized the tower’s cultural import on the town and declared it a national cultural treasure through P.D. 260 in 1973. The tower’s entire dome finally fell off from its crown after a magnitude 6.5 earthquake struck Laoag in August 1983. That tremor was felt at intensity 7 in northern towns including Bacarra. Remnants of the tower’s coral brick façade remain embedded on the ground beside the belfry ruins. Adding mystery to the museum is an underground staircase found behind the old convent and known to locals as the secret garden. At the bottom of the brick staircase are three tunnels which old Spanish records said lead separately to the Bacarra river, to the tower and to the church altar. Museum keeper Ramon Jove said the garden may have earned its name from the furtive tunnels that continue to well up with water all-year-round. “Water doesn’t dry up here even during dry spell. Maybe it leads to the river or a water reservoir,” he said. Jove said no one bothered to enter the tunnels since 1998 when a utility man tried to siphon off water from the pit.